November 3, 2018 6:04 pm. It was hugs all round for the battlers who bought into Victoria Derby winner Extra Brut. What happens when you combine an Irish jockey who couldn’t get a ride back home, a Hong Kong billionaire, a big group of everyday Aussies and the country’s most prolific trainer? You win the $2 million Victoria Derby, Australia’s oldest Classic. Chants of “Bruty, Bruty, Bruty” turned into “Johnny, Johnny, Johnny” as ecstatic owners cheered their horse Extra Brut and jockey John Allen after Saturday’s win. “It’s a dream come true,” one declared, before the attention turned from hugs all round to selfies with Allen and trainer Darren Weir. 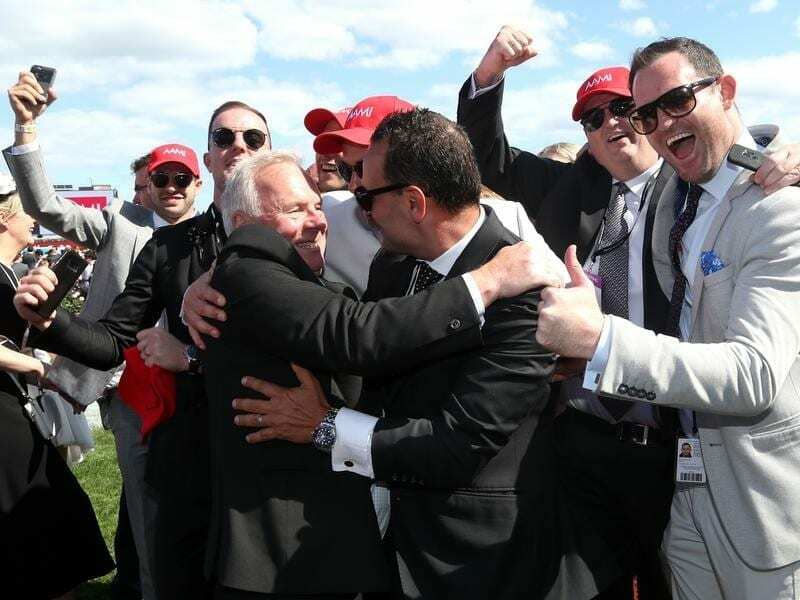 Weir was stoked to win his first Victoria Derby but even happier for Allen and the large group of people who bought into the horse through a syndicate. Victoria’s leading trainer teamed up with the Irish jumps jockey two years ago. “I couldn’t get a ride back home, plain and simple,” Allen said. He was delighted to win a big race at Flemington in front of about 90,000 people. And he earned a rock star reception from the 30 or so friends of friends who bought a stake in Extra Brut through syndicator Spicer Thoroughbreds. “They’re very enthusiastic owners. It’s great for them, a big crew like that,” Allen said. The syndicate came together through friends of friends of friends phoning one another to ask “do you want to get in”. Robert Comley was one of those who said yes. He struggled to explain the feeling of winning such a big race before the Essendon supporter declared it a bigger thrill than if the Bombers won an AFL grand final. “This is surreal,” he told AAP. “You don’t get into horse racing to make money. You get in it to be with your friends. Comley has had stakes in other racehorses but Extra Brut is the first good one. Hong Kong billionaire Tony Fung was a late addition to the Extra Brut party, with his Aquis Farm racing and breeding operation only buying into the horse three days ago. Aquis Farm CEO Shane McGrath said it was unbelievable.